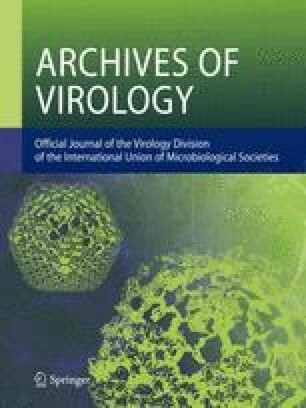 Nucleotide sequences encoding the four capsid proteins of foot-and-mouth disease virus subtype O2Brescia/1947 have been determined. These and the deduced amino acid sequences were compared with those of a subtype O1 virus strain. The nucleotide sequences differed at 259 positions, causing only 35 amino acid changes. VP 4 and VP 2 differed by 2.4 and 1.8%, whereas VP 1, known as major viral antigen, and VP 3 differed by 8% and 5.5%, respectively. The differences occur mainly in protein domains not involved in the formation of α-helices and β-sheets, suggesting that the surfaces of both viruses are more variable than their scaffolds. The O2Brescia sequence has been submitted to the GenBank data base and has the accession number M 55287.